Today,Global Currency Market has shaken by China’s devaluation of its currency - Yuan. China's central bank devalued its Yuan currency by nearly two percent against the US dollar. Now back home, how many of you know that Indian Currency - Rupee, has a history of devaluation?. 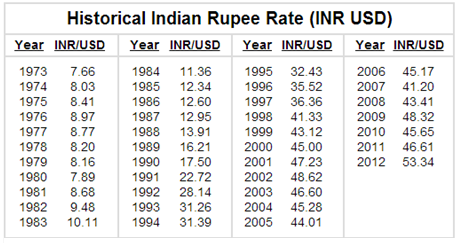 This post is meant to give you a heads-up of the history of Indian Rupee Devaluation. Despite government attempts to obtain a positive trade balance, India suffered a severe balance of payments deficits since the 1950s. Inflation had caused Indian prices to become much higher than world prices at the pre-devaluation exchange rate.When the exchange rate is fixed and a country experiences high inflation relative to other countries, that country’s goods become more expensive and foreign goods become cheaper. Therefore, inflation tends to increase imports and decrease exports. Since 1950, India ran continued trade deficits that increased in magnitude in the 1960s. Another additional factors which played a role in the 1966 devaluation was India’s war with Pakistan in late 1965. The US and other countries friendly towards Pakistan, withdrew foreign aid to India, which further necessitated devaluation. Because of all these reasons, Government of India devalued Rupee by 36.5% against Dollar. In 1991, India still had a fixed exchange rate system, where the rupee was pegged to the value of a basket of currencies of major trading partners. At the end of 1990, the Government of India found itself in serious economic trouble. The government was close to default and its foreign exchange reserves had dried up to the point that India could barely finance three weeks’ worth of imports. In July of 1991 the Indian government devalued the rupee by between 18 and 19 percent. The government also changed its trade policy from its highly restrictive form to a system of freely tradable EXIM scrips which allowed exporters to import 30% of the value of their exports. 1975: India links rupee with basket of currencies of major trading partners. Although the basket is periodically altered, the link is maintained until the 1991 devaluation.